Want to connect with Suzy? During my career I have learned that a soft touch accompanied by kind words and true empathy can change the life of the elderly both healthy and definitely for those suffering with Dementia. 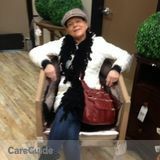 Having worked both sides of the healthcare industry, first as a Wellness Coordinator/Manager of a healthcare floor in a large eldercare residence ( 46 clients with varying degrees of Dementia) and also as a private homecare nurse, I am very much aware of the responsibility placed on the family to find the perfect fit when it comes to the care of their loved one. It is a very dedicated individual who is required for the many roles involved with this position. Above all, patience and understanding of each elderly individual placed under your care and the bottom line being what they truly require from you as a caregiver. Always listening rather than just hearing, I have learned that even those who have lost themselves completely in their Alzheimer\'s have so much to say. After thirty plus years in the corporate world and a change of careers ten years ago, I have found the passion for giving back. At the end of each day I am a better person for this change. I am hoping that you find my information of interest, keeping in mind this is but an overview of my abilities and experience. Thanking you in advance and hope to hear from you in the near future. Experienced nanny available for Full time or Part time!